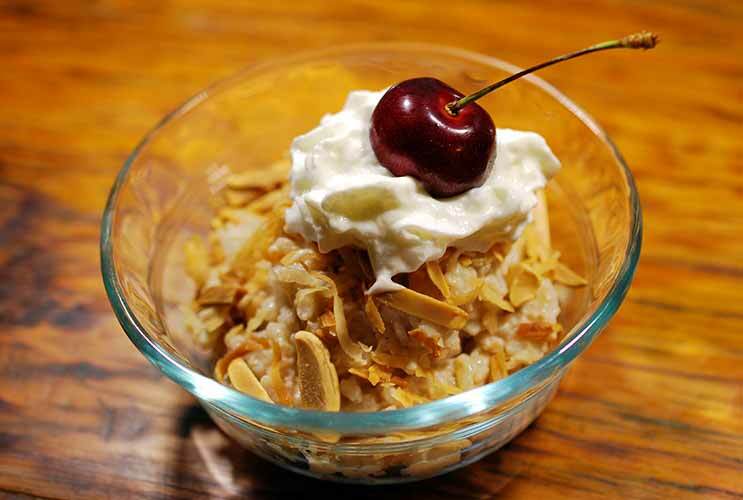 Arroz con leche, or rice pudding, was a favorite of mine as a kid. Not many desserts have a children’s song named after them, so right away you know that it has to be good. I recently got a craving to revive this classic, but I thought the texture could use a little tweak. I got the idea to replace the usual rice with Arborio, one of the varieties traditionally used to make risotto, which has a wonderful balance of creaminess and toothsome bite, without being soggy. While I was conceiving this dish, another childhood food memory crept into my mind. Coconut shakes in various are popular in many places throughout Caribbean and Latin America, but the first time I remember trying one was at roadside farm stand while visiting my grandma on Venezuela’s Margarita Island. Those creamy cocadas laced with cinnamon from that little thatched roof hut became the flavor inspiration for this pudding. This would be a great dish on which to experiment by switching up the toppings. For another take, skip the cinnamon and top the pudding with pineapple chunks for a piña colada arroz con leche.